Anyone with previous knee injuries or issues knows the value of the best knee sleeves for running. These running accessories make sure you can run in comfort safely. Just what do knee sleeves do for runners? These products support the ligaments and muscles around the joint to give it extra stability as you run. The compression in the knee region ensures that with each impact on the ground your knee stays in the proper position to prevent injury or pain. Compression also helps increase the flow of blood in the area. This helps keep the area warm and allow the muscles to move better. Here are the best knee sleeves for running available. Below the top picks, we have a review of each of the products to help you decide which one is for you. Best Knee Sleeves for Running: When it comes to running, choosing a more comfortable, flexible sleeve lets you take your normal strides while getting added stability and compression. For that, this McDavid sleeve is our top pick. This is a pull on sleeve that offers support. Its compression helps with tendonitis as well as those with arthritis, making it something that’s useful for relief. Unlike the thicker knee sleeves that are used for weightlifting and squatting, this one isn’t as thick or as constricting. It does offer a good level of compression with its 3.2mm thick neoprene material. This makes it useful if you have recurring knee issues that flare up when running or are working your way back from injury, surgery or recovery. The fabric is heavy duty as well as durable, we also like that it is seamless behind the knee which adds to the comfort and you have that thing rubbing against your with each stride. The sleeve offers good flexibility that you can use your normal running form and isn’t too warm that that it becomes bothersome midway through the run when you’re sweating and have good blood circulation. Another comfortable option that provides support for stabilizing the knee joint and helping prevent fatigue and pain is this compression knee sleeve from Wolsport. Sold in singles, this is constructed with a mix of 50% spandex, 25% nylon and 25% elastic band. It stretches in all 4 directions allowing you to easily fit it on as well as not get too constrictive on any side of the knee. The sleeve is designed to limit the movement of the patella offering support. This, along with the warmth it delivers helps provide the relief from pain from existing, recurring or past injuries. The compression likewise helps deliver more blood flow through the area around the knee which helps reduce or eliminate fatigue, pain or swelling, especially after your run. The product is offered in 4 sizes, based on the circumference of the area just under the kneecap. This is a reversible knee sleeve that’s black on one side (the main side) and red on the inner side. It comes with 2 sided nylon construction making it sturdy and durable. This offers very similar compression to the closed patella version above also from McDavid. 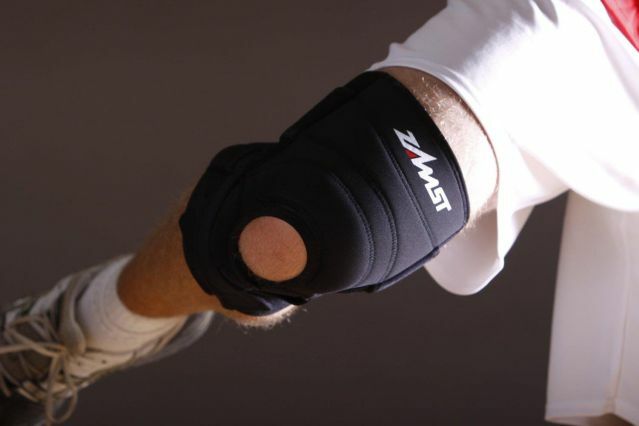 It gives you their level 1 protection which is for support, compression, pain and injury relief. This is a lightweight knee support that’s also constructed with neoprene. It helps promote healing as well as relieves pain from prior injuries that can flare up when you go running or from overuse injuries like tendonitis. It also helps with wear and tear issues like arthritis. The one difference between this and the McDavid knee support above is the open patella design. This one has a hold that exposes the kneecap (patella). The open knee design allows it to be more flexible and also offers more ventilation so the knee doesn’t get as warm. This gives the runner extra comfort in that they have better range of motion as well as less constriction of movement. We’ve seen some people wear this sleeve the entire day because they’re much more comfortable that the regular closed patella versions. Bend you knee slightly (less than 45 degrees). Then use a tape measure to get the circumference around the kneecap. The chart below shows you the size based on your knee circumference. Small size: circumference of 12” to 14”. Medium size: circumference of 14” to 15”. Large size: circumference of 15” to 17”. XL size: circumference of 17” to 20”. 2XL size: circumference of 20” to 22”. Thin, lightweight knee sleeve: Runners who prefer something that has a thin design and is lightweight will like this product by CopperJoint. It’s designed to be much thinner than other sleeves (especially weightlifting ones) to make it easier to move and run. It also does offer a good amount of compression giving your knee extra stability, as well as helping promote muscle and joint recovery. The product is constructed with 88% copper infused nylon and 12% spandex. This makes it comfortable to wear, so you can use it for longer runs. Meanwhile, the light weight (180 grams) lets you keep in pace with your performance times. The fabric blend is also designed to be breathable which lets the area have optimal warmth without getting too hot. It has an extra benefit of being UPF 50+ which protects the area from harmful ultraviolet rays of the sun.